The key drivers of the Element project included ‘de-siloing’ the separate business units whilst still appreciating the needs of each business unit. 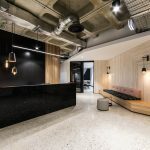 The client desired a new workplace that would reflect the way that they wanted to work which was a change to collaborative and inclusive workplace strategies. Prior to project commencement Element underwent a re-branding exercise. IA Design had to ensure that they worked closely with the re-branding team to ensure that this was captured and integrated within the new fit out. Element works predominantly in the urban built environment and so the starting point was to look at the language of the streetscape and try and express that in the detailing and the materials. Element wanted the workplace to be a reflection of what they do. The outdoor street paver that line the lift lobbies, reference the urban streetscape. The stairs are steel and concrete with an industrial aesthetic and are where people sit and interact whilst having a tactile relationship with the space, the seating area was finished off using warm solid timber. The client wanted their new space to be somewhere where clients would feel welcome. IA Design blurred the lines between front of house and the office area to ensure they were not segregated from each other. The workplace was designed without any hierarchy with every office available to all employees. 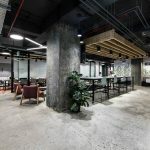 IA Design successfully achieved an open plan office space that reflected a connection between the urban space in which they work and there office space. The final outcome captures the urban aspect into the fit out through elements of the streetscape, planning and raw finishes. IA Design has provided an environment that has positively impacted the way Element work with a connection to place despite any constraints or limitations faced along the way.